About CMA Final Course – Fee, Syllabus, Apply, Last Date, etc. Home CMA CMA Final Course Details – Fee, Syllabus, Apply, Last Date, etc. CMA Final Course Details – Fee, Syllabus, Apply, Last Date, etc. 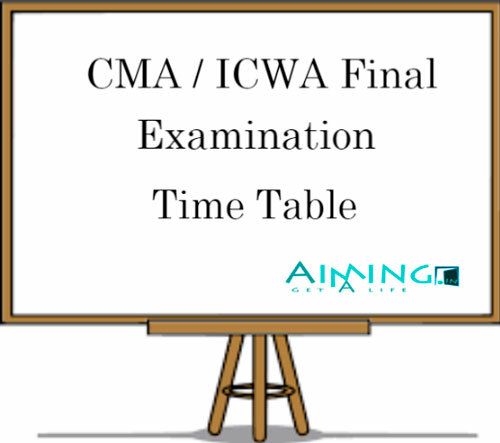 In this article, you can get the detailed explanation of ICAI Final Time Table, complete CMA Final Course Details like Qualification Required, Fee Structure, Syllabus, Apply, Last Date, etc. read the article completely to get full knowledge and browse this website for more information. In our previous article, we wrote about CMA course details read that article also. These 3 level examinations are held twice a year i.e. one is in the month of June and another one is in the month of December. You can take register yourself directly to CMA Foundation or CMA Intermediate or CMA Final level depending on your eligibility. A student must have Graduation in any discipline (except Fine Arts) or equivalent. Read below ICWAI Syllabus for CMA Final Exam. ICAL Final Examination consists of 2 stages of 4 papers each of 100 marks each. At least 50% marks are required to pass the CMA Final exam, aggregate in the both the session.